In this article we will learn how to bind data from a table to a DropDownList in MVC using LINQ to SQL. In this article we will learn how to bind data from a table to a DropDownList in MVC using LINQ to SQL and learn how to populate a child dropdown list depending on each new value as values are selected in the parent's DropDownList. Create two tables in the database with the names Country and State. In the preceding SQL query, countryid is the primary key. 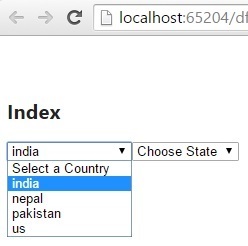 In the preceding SQL query, stateid is the primary key and countryid is the foreign key reference by country table. Right-click on the project and select "Add new item", then select Data from the templates. Choose "LINQ to SQL classes" from the list and provide a name. Now after clicking on Add, you can see the .dbml file in the project. 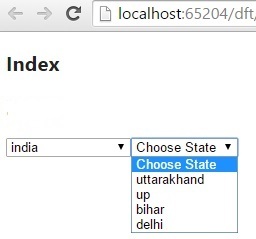 Drag the country and state tables from the database in the Server Explorer. Right-click on the Index ActionResult method and select Add View. After selecting Add View, a dialog box will open. The view name is the index by default. Now select your model class and click on the OK button. The following is the output of the preceding code. In this article we learned how to bind data from a table to a DropDownList in MVC using LINQ to SQL and learn how to populate a child dropdown list depending on each new value as values are selected in the parent's DropDownList.